Have you hung out with a schoolteacher lately? In general, we are a pretty mild-mannered set. Sure, there’s the occasional Thursday-night margarita/gripefest, but by and large the teachers I know are mostly interested in doing their jobs well and eventually paying off their student loans. So why, oh why, have teachers always been at the forefront of our educational culture wars? For at least a century, teachers have been the darlings of the Left and the demons of the Right. We didn’t have much money, but my parents and grandmother made sure we took our education seriously. I was blessed to have great public school teachers who poured their energy, time and love into me. Without them I wouldn’t be running for Governor today — and next year as Governor, we’re going to give all of our teachers and support staff the raise they deserve. From setting a statewide floor for new teachers’ salaries of $50,000, to bringing every public school instructional teacher up to the national salary average of $58,000, and making sure veteran teachers are compensated for their years of service, it’s time our teachers get paid appropriately for doing some of the important work in our society. Right now, they’re woefully underpaid, and many are struggling to provide for themselves. For Mayor Gillum and other lefties these days, public-school teachers represent all that is good and hopeful in American politics. By maintaining strong unions (maybe) and striking for better conditions, teachers have come to serve—for some—as a symbol of socialist promise. spending time promoting a left-wing agenda and bullying conservative students rather than teaching the subjects they are paid to teach. It was ever thus. As I argued in my book about the history of conservative educational activism, I looked at culture-war thinking about teachers throughout the twentieth century. In every decade, in every school controversy, teachers were beloved by progressives and despised by conservatives. The assumptions were usually the same—wild-eyed leftist teachers were trying to warp their students’ minds, to get kids to embrace the latest versions of amorality and socialism. … or hate em, both sides agree that teachers are progressive culture warriors. a tragically misshapen generation . . . without the ability to think for themselves, filled only with the desired herd ideas—fit only to be citizens of the authoritarian state? Both Zoll and Browder were extremists, but they shared this vision of the power, promise, and plausibility of large numbers of teachers who see their main goal as promoting leftist politics. And, of course, the stereotype sometimes fits. I know teachers who see their primary mission as political. Some teachers hope to push their students toward a leftist viewpoint. But most teachers are mainly trying to help students do as much as well as students can. Do many teachers really fit the culture-warrior stereotype? If not, why are those stereotypes so powerful and so enduring? The decision to remove Dayanna Volitich, a 25 year old social studies teacher at a middle school in Florida, from the classroom, after it was discovered that she hosted a white nationalist podcast raised the question of the right to free speech. Was Volitich denied freedom of speech? She expressed horrendous beliefs on her podcast, including agreeing with a guest who maintained that an African child has a lower IQ than a child born in Sweden. On her February 26, 2018 podcast, Volitich, who went by the pseudonym Tiana Dalichov, maintained that there is scientific evidence that some races are more intelligent than others. But should she have been removed from the classroom because she expressed racist views on a podcast? During the Cold War teachers, college professors and others were targeted for their political beliefs. Hundreds of New York City public school teachers were forced to resign, retire, or were fired because they were members of the Communist Party. Not one of the teachers fired, forced to retire or forced to resign because of their political affiliation were ever found to be derelict in the classroom. None were found guilty of spreading Communist propaganda to their students. They simply lost their positions because of their membership in the Communist Party. No matter how appalling Volitich’s views are she has the constitutional right to express those views. I am sure that a vast majority of Americans think that Volitich’s ideas are distasteful. But the views of Communist teachers were distasteful to many. Because views are seen as repugnant to a large number of people does not mean that those expressing those views should have their constitutional rights revoked. A different world? Or just a different context? One may argue that unlike the victims of the Cold War, where they were purged for just Communist Party membership and taking part in communist led activities outside of the classroom, it is claimed that Volitich eagerly touted her white supremacist views to her students. She even confessed on her podcast, that she shared her white supremacist ideas in the classroom. According to Volitich when parents complained to the principal that she was espousing her racial ideology to her students, she admitted that she lied to the principal by denying she was attempting to spread her racist views. But even with her claim on her podcast and a few parents complaining that she advocated her Nazi doctrine in class, at this point there is no hard evidence that Volitich was advocating white supremacy in the classroom. Nowhere is it mentioned that school officials, including those who must observe her in the classroom, ever complained that she was spreading white supremacist doctrine to her students. Moreover none of her colleagues ever complained of her views. Is what someone claimed on a podcast grounds for dismissing her from her position as a teacher? Shouldn’t a teacher be judged for what she does in her classroom and for service to her school? One may argue that the ideas Volitich expressed are dangerous to the larger society therefore she should be fired. But that was the same argument that was used to purge teachers and professors from their position. Those who were responsible for the dismissal of teachers during the Cold War maintained that their membership in the Communist Party deemed them as dangerous to the country. There was no need to prove that they were indoctrinating students. Cold War crusaders argued that the mere fact that they were communists and communist sympathizers disqualified them from the classroom. Today many recognize that the New York City teachers were simply victims of overzealous anti-Communist warriors. Let’s not make the same mistake with those on the extreme right. Queen Betsy loves ‘em, but a new research review in EdWeek shows little evidence that voucher programs are good for students. Seeing the future? CNN Money looks at Wisconsin after six years of restrictions on teachers’ unions. At The Atlantic, Hal Boyd asks why it’s still okay to make fun of Mormons. Blame the media, from Matt Latimer at Politico. Molly Worthen explains the presuppositionalist connection, in USA Today. Judge Moore gets women to vouch for him. Moore’s long history of culture-war activism, from NYTimes. The “college gap” widens. Economist Charles Clotfelder discusses his study of higher education. The takeaway: rich private schools are vastly different from struggling public ones. Is the new bajillion-dollar Museum of the Bible going to succeed at avoiding controversy? Nope. Liberals wonder why the museum whitewashes. Non-Christian critics say it ignores half the story. Young-earth creationist Ken Ham absolutely loves it. Other conservative evangelicals are equally agog. It’s back. The US Supreme Court has agreed to hear another teacher-union case. As SAGLRROILYBYGTH are painfully aware, the conservative sport of teacher-union-bashing has a long history. The current case will likely redefine the landscape of school unionism. 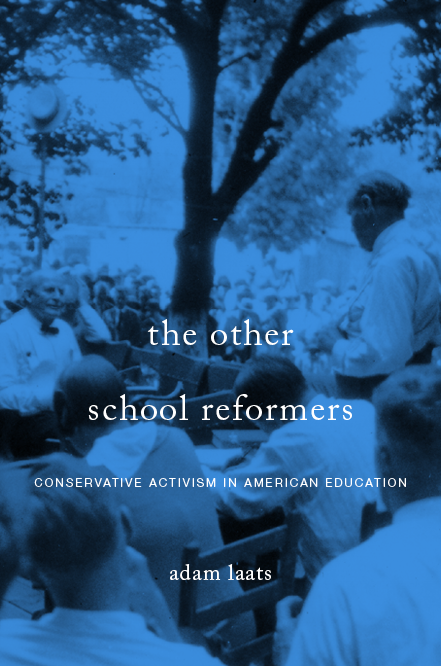 As I explored in my book about educational conservatism, beginning in the 1930s conservative activists attacked teachers’ unions as dangerous fronts for communist subversion. Conservative patriotic groups exposed the connection of unions to leftist academics such as Harold Rugg. They pushed successfully for loyalty laws to sniff out subversive teachers. In cities like New York, during the 1940s and 1950s, such union-bashing achieved great political success. Fueled by the testimony of former-communist-turned-witness Bella Dodd, the New York City School Board declared war on communist-affiliated teachers’ unions. establishes such authority over its members that it can swing their emotions now for and now against the same person or issue. Teachers might be well-meaning folks, Dodd wrote, but at best they served as dupes for mind-controlling communist spies and sneaks. Such warnings carried great political weight. As historian Clarence Taylor has pointed out, by 1955 239 teachers and board personnel had been forced out of New York City schools, accused of subversion. From Hearst’s New York Journal-American, July 7, 1948. No one these days is going to stand in front of SCOTUS and accuse teacher unions of communist subversion. The issue is still one of left-leaning political influence, though. The most recent case before this one, Friedrichs v. California, hoped to give teachers freedom to refuse to pay union dues. In many states, even if they don’t join the union, teachers have to pay a portion of the union’s dues, since the union bargains collectively for all teachers. Justice Scalia’s death forced that case into a 4-4 deadlock. Plaintiffs in the new case, Janus v. American Federation of State, County, and Municipal Employees, hope the new court will give them a decisive win. The plaintiffs are hoping to be allowed to opt out, since, as Rebecca Friedrichs argued in the previous case, union support is “quintessentially political.” Forcing teachers or other workers to pay for political activism, plaintiffs insist, violates their rights. With Neil Gorsuch filling Justice Scalia’s seat, it’s likely they’ll win. No one’s saying “communist subversion” anymore, but the long legacy of conservative anxiety about teachers’ unions remains politically potent.